Do you recognise the clothing? The incident occurred between 8.55pm and 9pm at the shop in St Michael’s Road, on Monday, April 8. 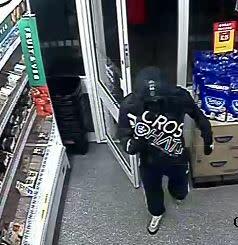 The male suspect entered the store at approximately 8.55pm from the direction of Claythorpe Road. He pulled out a weapon which resembled a black handgun and told the member of staff behind the till to hand over money. He then made off with a quantity of cash, again in the direction of Claythorpe Road. The suspect is described as wearing a very distinctive dark hoody with a camouflage design with white writing on the chest area. He was also wearing dark tracksuit bottoms with white stripes up the leg. His face was covered with a black balaclava or scarf and he was wearing white trainers with reflective detail. Were you in or around the vicinity around the time of this incident? Did you see anything or anyone acting suspiciously? If you can help, please call 101, quoting reference 44190122028.